Anthony Minghella, who won an Oscar for directing The English Patient (above, 1996), died today, March 18, at Charing Cross Hospital in London. He was 54. “It was a very hard job to get someone to give us the money for this,” Minghella told Reuters following the release of The English Patient. “It was a very unpromising document: a European film about a man haunted from his war-time past, good actors but no stars [Ralph Fiennes, Kristin Scott Thomas, Juliette Binoche] and a director who had little experience. Based on Michael Ondaatje's novel, The English Patient went on to become a worldwide hit. The romantic drama earned 12 Academy Award nominations, winning 9 Oscars, including for best film, best director, best supporting actress (Juliette Binoche, in a major upset), best cinematography (John Seale), and best original score (Gabriel Yared). 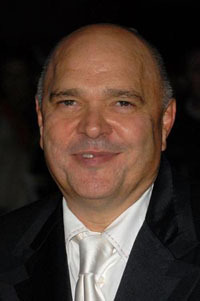 Anthony Minghella was born to Italian parents on the Isle of Wight. He studied drama at the University of Hull in northeast England, and later directed stage productions. In addition to The English Patient, Minghella directed six other feature films. Among those he both directed and wrote are Truly Madly Deeply (1990), which won him a British Academy Award for best original screenplay; The Talented Mr. Ripley (1999), a serviceable adaptation of Patricia Highsmith's novel, with Matt Damon playing an ambitious gay psycho-turned-murderer; and Cold Mountain (2003), an overlong and artificial adaptation of Charles Frazier's Civil War novel. Cold Mountain, featuring Jude Law, Renée Zellweger (who won a best supporting actress Oscar for her impersonation of Betty Hutton in Annie Get Your Gun), and a much-too-prettified Nicole Kidman (above) ended up being an Oscar disappointment for Miramax – neither Minghella nor the film were nominated, marking the first time since 1991 that Harvey Weinstein's studio failed to nab a best picture nod. Minghella's last feature was the psychological drama Breaking and Entering (right, 2006), starring Jude Law, Robin Wright Penn, and Juliette Binoche. The film was not a commercial success, though it had some admirers. His final directorial effort was the BBC/HBO TV movie No 1 Ladies Detective Agency, based on Alexander McCall Smith's novel set in Botswana. It is scheduled for a March 23 premiere on BBC1. Additionally, he was reportedly working on a couple of new projects. Roman Polanski Statement Accuses Los Angeles D.A. Anthony was responsible for one of my favorite memories from childhood and that would be as the writer and sometime director of Jim Henson's THE STORYTELLER series.